Valley Radiology is proud to offer a variety of diagnostic services including computerized tomography (CT Scans or CAT Scans), to patients throughout southeastern NC. Computerized Tomography is a diagnostic procedure that uses special X-ray equipment to obtain highly detailed images of the body. Our CT computer displays these pictures as detailed images of organs, bones and other tissues, and can help our expert radiologists clearly and efficiently diagnose and treat patients. The CT Scan, which is painless and takes 15-45 minutes to complete, is considered one of the best tools for studying the chest and abdomen, and physicians often prefer this method for diagnosing many different cancers. CT examinations can also be used to plan and administer radiation treatment for tumors, serving as a tool to guide physicians performing biopsies or minimally invasive procedures. 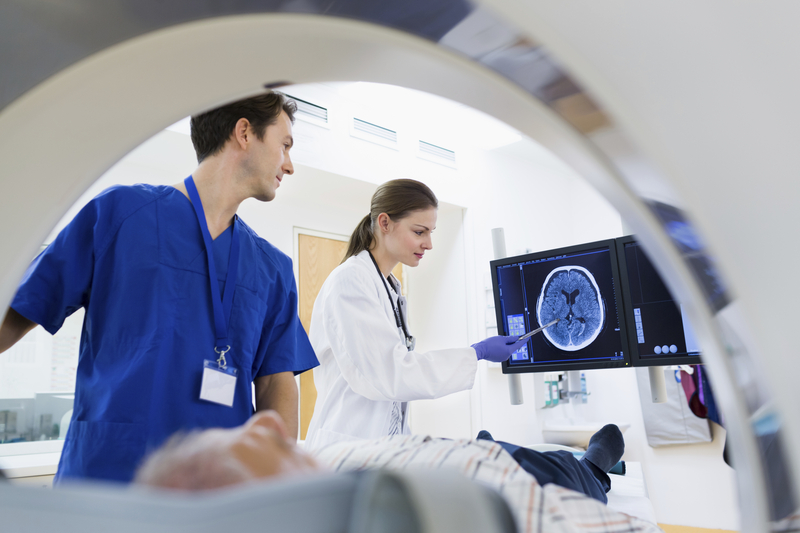 CT Scans at Valley Radiology are cost-effective and thorough, performed by expert technicians in a welcoming atmosphere at one of our clinics or at a clinic or hospital in the area. Abdomen and Pelvis - An abdominal CT scan is an imaging method that uses X-rays to create cross-sectional pictures of the belly area. Head - A head or brain CT examines the various structures of the brain to look for a mass, stroke, area of bleeding or blood vessel abnormality. It is also sometimes used to look at the skull. Sinuses - A sinus CT exam is used to both diagnose sinus disease and to look for a narrowing or obstruction in the sinus drainage pathway. Spine - A spine CT test is most commonly used to look for a herniated disc or narrowing of the spinal canal (spinal stenosis) in people with neck, arm, back and/or leg pain. It is also used to identify a fracture or break in the spine. Chest - CT of the chest is frequently used to further study an abnormality on a plain chest X-ray. It is also often used to look for enlarged lymph nodes. Neck - A neck CT checks the soft tissues of the neck and is frequently used to study a lump or mass in the neck or to look for enlarged lymph nodes or glands. Heart - A computed tomography angiogram (CT angiogram) is a test that uses X-rays to provide detailed pictures of the heart and the blood vessels that go to the heart, lung, brain, kidneys, head, neck, legs and arms. Whether you're in need of an abdominal CT scan in Fayetteville or you're looking for a place to receive diagnostic imaging from a team of experts, we can offer you state-of-the-art technology and advanced procedures. Call Valley Regional Imaging (910) 323-2209 or Valley Radiology Angier (919) 331-2001 to schedule an appointment with one of our radiologists, or contact us online to ask any questions. Valley Radiology offers comprehensive computerized tomography, providing CT scans for many parts of the body, to patients in Fayetteville, Whiteville, Angier, Fuquay Varina and throughout southeastern NC.